Ft. Lauderdale’s Intracoastal Waterway was alive with the sound of music as the Florida Grand Opera’s Young Artists presented a spectacularly beautiful aria of songs aboard the Caprice on Sunday, April 10th. 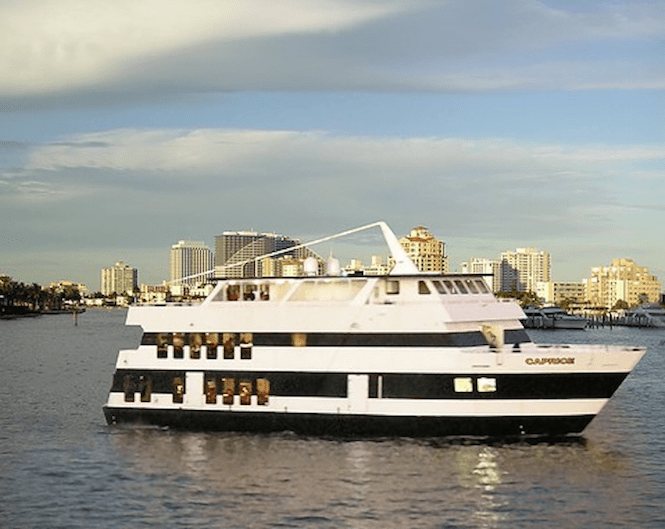 The Luncheon Gala was sponsored by Sun Dream Yacht Charters to celebrate owner Bob Brantmeyer’s twenty-year tradition of supporting Florida Grand Opera. President Claire Crawford thanked Bob Brantmeyer, President of Sun Dream Yacht Charters, who said, “Sun Dream Yacht charters are an important business within our community and have supported Florida Grand Opera for 20 years because the opera is such an important part of the cultural life of this community.” We thank Bob and his wife Ann for hosting and underwriting this spectacular event, which raised $8950 towards Florida Grand Opera in this their 75th Anniversary Season. After the performance, guests enjoyed a delicious buffet lunch as we cruised the Intracoastal waterway, which has earned Fort Lauderdale its reputation as the “Venice of America.” Oh, what a view as we admired the grand homes along the waterfront on this most beautiful sunny day. We would like to thank the Luncheon Gala Committee, co-chairs Isobel Sturgeon and Karen Mathieson, organizing committee Linda Balent, Barbara Parent, Ruth Molina, Claire Crawford, Eric Koskoff, and all our hosts and hostesses, as well as Justin Moss, Director of Broward Operations & Outreach, and the FGO Young Artists for making the day such as grand success. We thank our raffle donors: Weston Hills Country Club, Coral Ridge Yacht Club, and the Broward Performing Arts Foundation, Inc. for their support. To those who graciously provided additional support and underwrote the invitations, tip and valet, we thank Barbara Copanos, Linda and Alvan Balent, Isobel and Roger Sturgeon, Barry and Diane Hopkins, Mary and Richard Kazares, and Judith Doering. Most of all, bravo to Sun Dream Yacht Charters for hosting the luncheon Gala on the Caprice and for their twenty-year tradition of supporting Florida Grand Opera! Enjoy the lovely photos taken by our own Betty Young! Previous post: Over 50 Delight in the Season’s First Lyrical Luncheon!